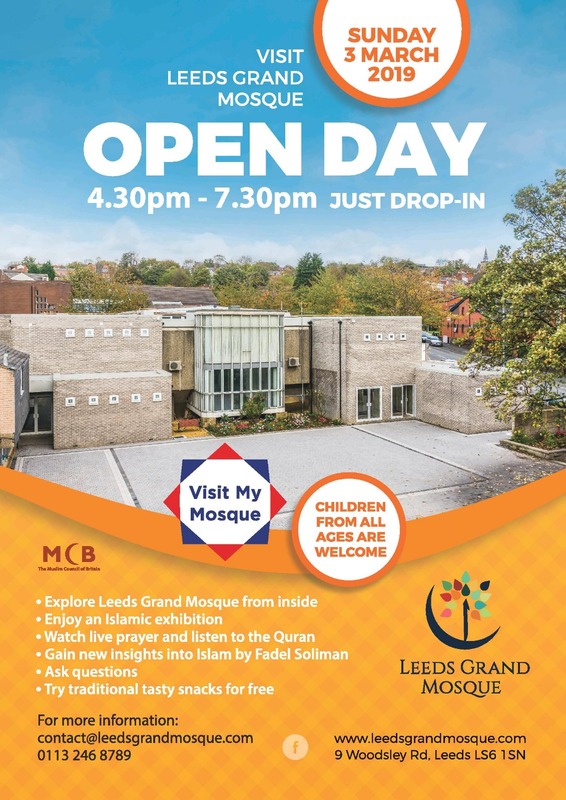 In the spirit of friendship and conversation we invite the people of West Yorkshire to our Visit My Mosque open day Sunday 03 March 2019 form 4:30 pm to 7:30 pm. We realise that many non-Muslims may not have visited a mosque before, so the open day is an opportunity for visitors to feel welcome to explore the mosque, to learn a little about the faith and Islamic culture and people, as well as seeing the activities and projects that take place inside our unique mosque. On the day visitors will be able to learn more about the faith through our exhibition panels covering subjects from Egyptology, scientific revelations in the Quran and how Muslims celebrate Eid. Gain new insights on Islam from Sheikh Fadel Sulaiman, ask question. There will be kids arts and crafts activities, demonstrations from our scouts group and Quran school plus an exhibition of pottery from our art classes. Visitors can also enjoy delicious mint tea and snacks from around the world. The event is open for everyone, you don't need to be Muslim to enter the mosque. No need to book.